It’s the 1961 World Science Fiction Convention in Seattle. Robert Heinlein is the guest of honor and “A Canticle For Liebowitz” takes the Hugo for best novel. In the crowd is manga-ka Shotaro Ishinomori, covering the show for Shuiesha. A resident of the famous ‘Tokiwaso’ apartment house with manga giants like Tezuka, Hideko Mizuno and Fujio-Fujiko, Ishinomori shared their speedy, cinematic, big-foot style and by ‘61 already had more than 75 different published works to his credit. 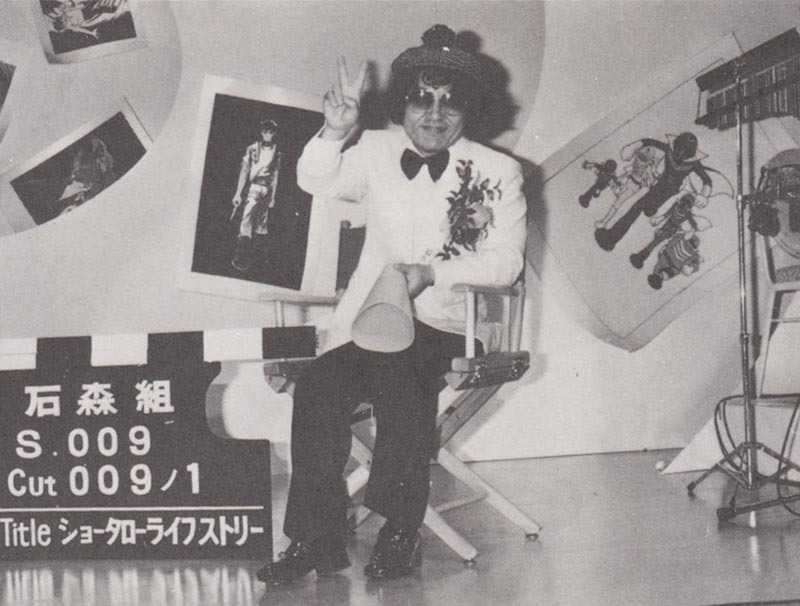 Shotaro Ishinomori’s comics would go on to have an almost immeasurable impact in Japanese and global pop culture, creating children’s adventure heroes like KIKAIDER, KAMEN RIDER and what we’d call “sentai” with GORANGERS. He’d explore economics with JAPAN INC, Edo-period detective stories with SABU & ICHI’S ARREST WARRANT, big city soap opera drama in HOTEL, manga about Charlie Parker, TV ghosts, magical girls and mischievous robots along with illustrations for the first Japanese edition of Frank Herbert’s DUNE. His work would inspire animation, live-action film and TV projects, and thrill generations of readers throughout the world for decades. A few months prior to the Seattle Worldcon, neurophysiologist Manfred Clynes and psychopharmacological pioneer Nathan S. Kline had coined the word “cyborg” in the journal “Astronautics” to describe the artificial modification of the human body to suit different environments. As an “exogenously extended organizational complex functioning as an integrated homeostatic system”, the concept would fuel practical and impractical research, but the term itself would be a boon for science fiction writers. SF had long been combining humans with machines or computers – the first example dates from 1879 - but now a sleek, futuristic word defined the concept. It’s unknown if the Clynes & Kline “Cyborg” paper was discussed at Worldcon, but as we’ll see eventually the term found its way to Ishinomori. 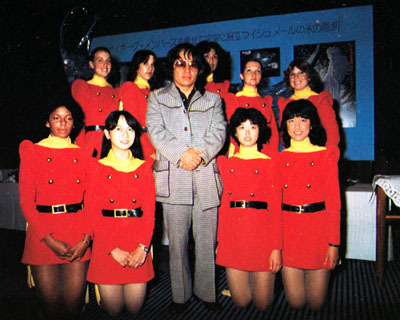 After completing his circumnavigation of the globe he returned to Tokyo and got right back to work on manga like MUTANT SABU, an adaptation of the cult Toho monster film MATANGO THE FUNGUS OF TERROR, and, for Shonen King in 1964, something called CYBORG 009. From around the world, nine people are kidnapped by the evil Black Ghost organization, a shadowy group dedicated to promoting war as a profit-making enterprise (even described as “merchants of death’, a callback to the devastating 1934 expose of war profiteers and the munitions industry). Our nine victims are transformed into cyborg soldiers to allow BG to bring war to the far reaches of the universe. However, they turn against Black Ghost. Along with their creator, Dr. Gilmore, the cyborgs battle Black Ghost’s attempts to recapture or destroy them and escape, free to try and fit into a world that no longer calls them human. The series’ cold war backdrop of military conspiracies, continent-destroying super weapons, and nuclear wars started by hateful third parties was balanced by science-gone-mad Frankenstein stories and tales emphasizing the tragedy of being turned into a cybernetic war machine. This is manga that dares to ask, can you be turned into an ultrapowerful cybernetic fighting machine, and still have a human heart? 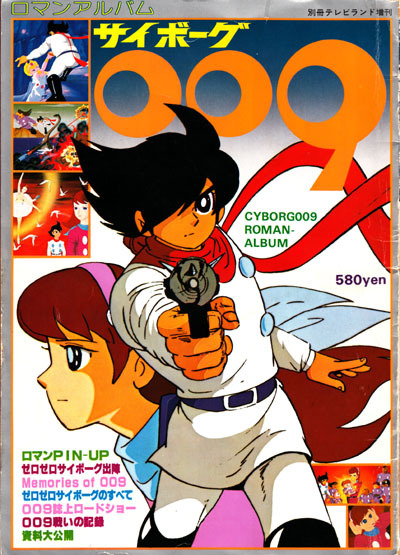 As a manga series CYBORG 009 was a hit for Shonen Gahosha’s Shonen King weekly, which also featured KAIBUTSU-KUN, the Jiro Kuwata BATMAN manga, WILD 7, GALAXY EXPRESS 999, and LOCKE THE SUPERMAN. Ishinomori’s combination of super-mechanical SF action and the tragic drama of people turned into machines was a winner with Japanese manga readers, and the first series lasted fifteen volumes’ worth. Ishinomori even tried to end it, but the readers demanded more, so just like Nishizaki and ARRIVEDERCI YAMATO, Ishinomori was forced to rewrite his own story to keep his characters alive. 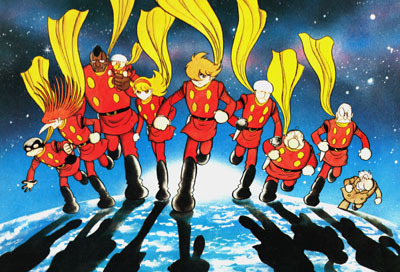 CYBORG 009’s manga adventures would continue through eight separate story arcs across nine different manga weeklies and monthlies, from 1964 until 1981 (in 2003 Tokyopop would release the first arc of the CYBORG 009 manga in North American markets across ten volumes with varying degrees of success). CYBORG 009’s cast stands out in a manga field full of loner heroes - a diverse group of individuals each with their own special abilities and temperaments. And while several of the cyborgs’ appearances border on racist caricature, every character – from the requisite Japanese leader to the African rebel to the Chinese cook – is portrayed as a human being, not a token or a prop. When they aren’t defending the world, they’re living their own lives as actors, restaurateurs, ranchers, or race-car drivers. 001 is the infant Ivan Whisky, who’s brain was restructured – by his own father, believe it or not - giving him incredible psychic power. Unfortunately this is incredibly taxing and he sleeps for weeks at a time, which may explain a few things on the part of Dad’s motives, who might have just wanted a good night’s sleep. 002 – Jet Link, the feisty big-nosed American, was taken right off the streets of New York City where his gang – The Jets – spread terror through synchronized dance routines. His character is named after James Dean’s character in GIANT, the ranch hand Jett Rink. As a rebuilt cyborg, jet engines in both his legs allow him to fly at supersonic speeds of up to Mach 5. 003 was a French ballerina named Francoise Arnoul until the Black Ghost restructured her as the ultimate detecting device with super sight and hearing. No relation to the French actress of the same name. She’s the typical ‘big sister’ token girl character, always demurely serving coffee, playing nurse or babysitting 001. Even her cyborg powers are largely passive. Is there a romance between 003 and 009? In spite of the difference in age and life experience, sources say “yes”. 004, German Albert Heinrich, escaped from East Berlin with his girlfriend in a zoo truck, but a hail of Vopo bullets killed her and seriously wounded Heinrich. Kidnapped en route to the hospital by Black Ghost agents, his body was almost completely rebuilt. One hand has machine gun fingers, another hand contains a super sharp blade, and depending on who’s animating the character, one or all of the knees and elbow joints contain missiles. A cynical character, he’s bitter about his rebirth as a war weapon, and who can blame him? 005 is the giant Apache Geronimo Junior. Even before he was cybernetcized, he had enormous strength and the strong spiritual nature typical of mass-media depictions of aboriginal peoples. After the Black Ghost was through, G. Jr. became immensely powerful and nearly indestructible. 006, Chan Chan Ko, was a Chinese cook. His culinary skills remain, even though now he can blast super hot fire from his mouth that can be both a weapon and a tunneling mechanism allowing him to burrow through the earth. The degree of stereotype involved in his character pretty much depends on the year the animation was made – if it’s the 60s you can count on quite a bit. 007 naturally hails from Great Britain. In fact his name is Great Britain! As an English actor he was legendary on the stage, but alcohol was destroying both his career and his life. His abduction by Black Ghost probably saved him from decades of staggering his way through countless embarrassing cinematic turkeys. Now his natural gifts of mimicry are increased a thousandfold as his body is able to shape-shift into just about any form regardless of size or complexity – mice, lions, missiles, coffee grinders, dolphins, you name it, he’s changed into it. In the 60’s era 009 anime he was depicted as a small and annoyingly voiced child. 008 is the African revolutionary known as Pyunma, who was changed into a specialist underwater cyborg. 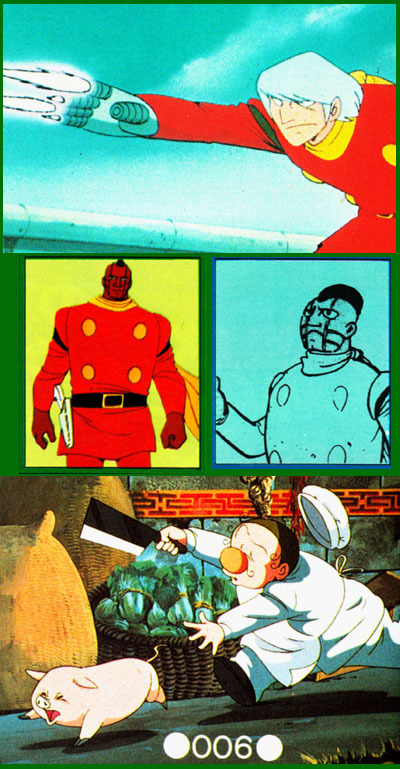 Early iterations of this character were astoundingly racist stereotypes, but subsequent character designs have, slowly, developed into something 009 fans can proudly display to others without reservation or embarrassment. As the only cyborg with actual military experience, his tactical knowledge comes in handy. Our leader 009 was the last cyborg built and as such is the most advanced. Joe Shinamura was a half-breed orphan with a background of abuse and neglect that, nevertheless, failed to change his nature as a kind, decent human being with a strong sense of shonen-manga-hero justice As a command-and-control cyborg he’s fast and strong, and his ‘acceleration switch’ can propel him at speeds up to Mach 5. 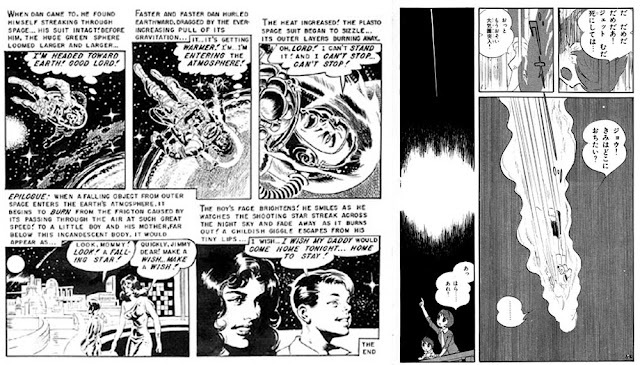 This can be traced directly to Alfred Bester’s legendary 1956 novel THE STARS MY DESTINATION, in which vengeance-driven spaceman Gully Foyle has himself rebuilt as a military-grade cybernetic commando whose amazing speed and reaction time is controlled by a switch concealed within a tooth, just like Cyborg 009. Coincidence? I think not. Professor Issac Gilmore, their creator, worked willingly with Black Ghost until he learned their true intentions, and then he conspired with the Cyborgs to escape. Cranky, irascible, driven, yet with a fatherly heart. 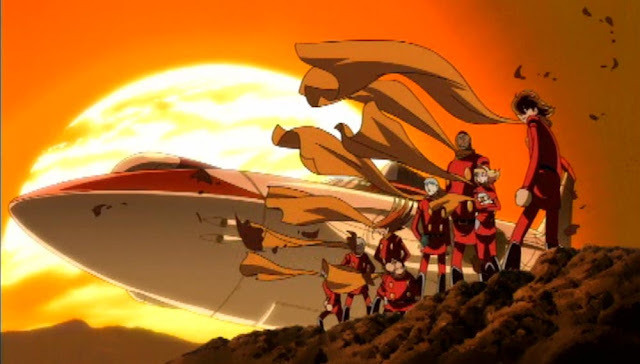 For Americans such as myself, nosing our way into the confusing new “Japanimation” world via American comic book fandom, CYBORG 009 was a great door opener. Science-fiction adventure starring alienated superheroes in a world that fears their power? Sounds a lot like the X-MEN comics we’d been reading. 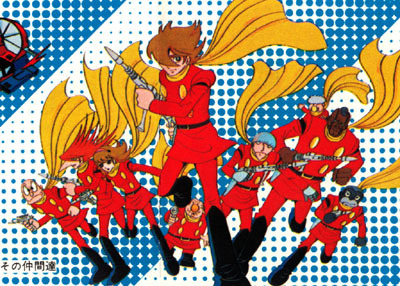 But while Marvel’s mutants would sink into a confusing morass of never-completed storylines and endless parades of new characters, CYBORG 009 followed Ishinomori as he moved beyond superpowered fistfights and explored themes of sacrifice, humanity, evolution, spirituality, and man’s place in the universe, in adventures involving mind-expanding journeys across time and space. 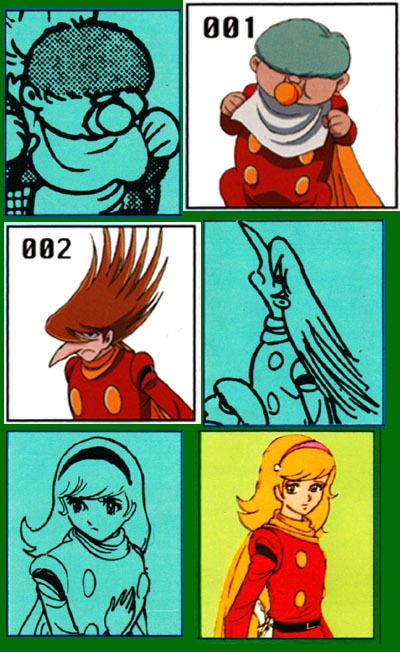 CYBORG 009 would be animated on, let’s see, seven? Eight? Nine separate movie and TV occasions, with varying degrees of animation, entertainment quality, and faithfulness to the source material. 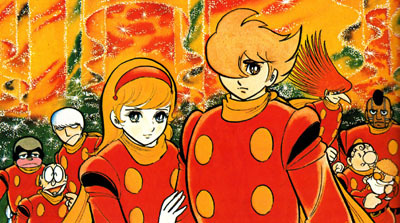 The first film, simply titled CYBORG 009, was released in July of 1966 and featured a radical re-design of the Cyborg characters as they moved through a streamlined version of their escape from Black Ghost. 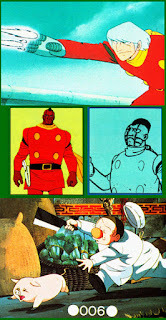 The character designs and costumes were given the squat, ovoid Hajime Numai treatment, including 007’s reinterpretation as a small child – obviously an identification character for the kids in the audience. The Yugo Serikawa animation moves in fits and starts, placing slick motion sequences next to long stretches of nothing. It’s the studio’s first attempt at an animated film based on a currently running manga property, and clearly in the same trail then being blazed by Mushi Productions’ ASTRO BOY and TCJ’s series ASTEROID MASK, YUSEI SHONEN PAPII, and TETSUJIN 28. 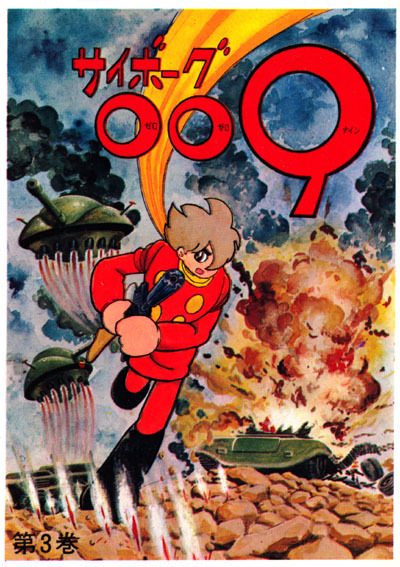 The sequel, CYBORG 009 - MONSTER WAR, would be produced by the same creative staff and released in March of 1967. This film is sometimes titled “Underground Duel” because that’s what the label on my VHS cassette read back in 1985. I spent years spreading the misinformation because I was too lazy to research it myself. As the film contains more “underground” than “monster”, it’s a natural mistake. 009 and the gang set out in their super air-ground-submersible to battle a league of giant monsters which are carrying on giant-monster tradition by decimating the world’s shipping, ports, natural gas storage tanks, and cities. Along the way they rescue the mysterious Helena, who leads them into an underground world populated by giant carnivorous plants and the evil Cyborgs 0011 Plus and Minus, and eventually to the lair of Black Ghost himself. But is Helena their friend or enemy? 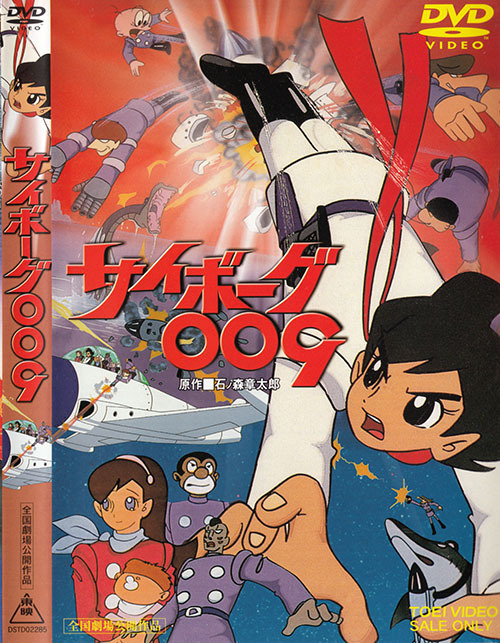 Unlike other Toei films of the 60s like GULLIVER’S TRAVELS BEYOND THE MOON or SINDBAD THE SAILOR, the CYBORG 009 films wouldn’t make it to American audiences, but Spanish-language theaters got their 009 under the title “Astroboy 009”. In Finland it was “Superagentit 001-009”. The next year Toei brought CYBORG 009 to TV in a 26 episode series, repurposing the theme song from the films but losing the color. 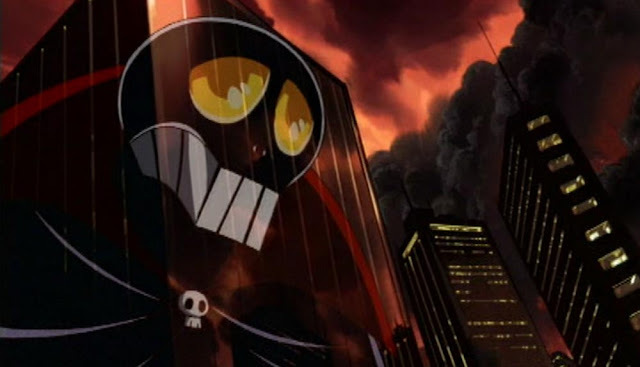 Many outstanding stories from the manga would appear in the TV show, including the “Mad Machine” South Pole story and the sad tale of Kubikuro the cyber-dog. Other plots were all over the map, from giant Inca robots to spy stories, Jekyll-Hyde monster tales, fleets of skeletal Imperial Navy pilots, and in general a lack of coherence or narrative logic; villains all have squads of faceless minions to be slaughtered and Dr. Gilmore has whatever scientific device necessary to advance the plot, from electron microscopes to orbital multi-stage rockets. The ’68 series is, again, not at all far removed from your typical SPACE BOY SORAN or SPACE KID JUN episode. The animation is still stiff in places but the character designs and action are moving away from the clean, round look of the early 60s – you can see a rougher, more confident hand in many scenes. Also one episode has a quick gag where 007 transforms into a surprised-looking James Bond. The powerful finale features demonic toys plotting to cause worldwide nuclear war by stirring up trouble between two hostile nations. 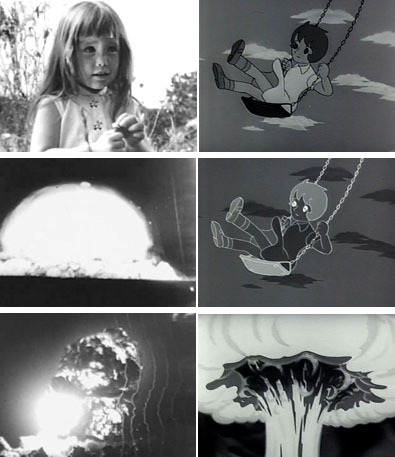 In a chilling dream sequence, one general imagines a peaceful world annihilated by atomic war in a montage that calls to mind the famous “Flower” television ad the LBJ campaign aired – once – in 1964. 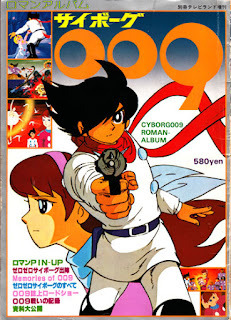 It would be ten years before CYBORG 009 would return to the animation world, with fifty episodes of Toei’s 1979 CYBORG 009 series on TV Asahi. Character designs changed again, now matching the manga costumes, but with a sketchier look more representative of late ‘70s anime styles. 007 became an adult, 008’s freakish stereotype became less objectionable, and everybody got scarves and giant boots and the occasional Yoshinori Kanada directed action scene. Two long story arcs pitted the 009 team against what appeared to be ancient Norse gods and a revived Neo Black Ghost, led by cybernetic triplets Brahma, Shiva, and Vishnu. The series was subtitled and broadcast on a few Japanese-language TV stations in America, notably California, Hawaii, and New York. Naturally the series was broadcast widely Europe, the Middle East and Asia; they get all the good cartoons. The 1979 series doesn’t attempt to retell or reboot or waste any time, from the first moment we’re thrown into a world where stone giants claw their way to the surface to warn the human race that the Gods have returned and boy, are they pissed. Rogue cybernetic surgeons rebuild boxers and soccer players with tragic results, disaffected youth join gangs, misguided scientists abuse sea-people, and through it all our Cyborgs struggle against injustice and fear. It’s a more mature anime series that deals with the energy crisis, the oil shock, prejudice, revolution and war along with the giant monsters, pirate submarines, killer plants, ancient astronauts, and UFOs. The evil triplets and Neo Black Ghost first appear in episode 22 and from then on dominate the series with their various plans to conquer the world and destroy the 009 Cyborgs, not necessarily in that order. As the series climaxes we learn that Brahma, Shiva and Vishnu, sons of an evil Tibetan sorcerer, were non-cybernetic humans when they murdered their way to the top of Black Ghost. However, once they achieved their goal, doubts set in. Were they evil ENOUGH? The triplets ordered top Black Ghost cyber- surgeon Gamo to remove all the “good” parts of their bodies and replace them with cybernetic parts, so as to make them completely evil. This kind of ethics-based biological determination might not make any sense in the real world, but in the CYBORG 009 context it sells. Completing his work, Gamo realized he had enough body parts left over to make a complete human – the result is Gandar, the “Jesus Of The East”, who is, you guessed it, completely good. When his good works start interfering with the Triplets’ evil plans, the stage is set for a world-shaking explosion aboard Black Ghost’s Shangri-La Project satellite! Can 009 and the cyborgs survive to reach the end of their television series? 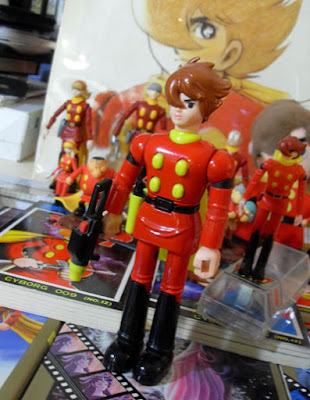 As the 70s progressed, the CYBORG 009 manga became wider in scope, sending our heroes across the universe in mind-bending adventures through time and space that questioned the nature of reality and man’s place in the universe. 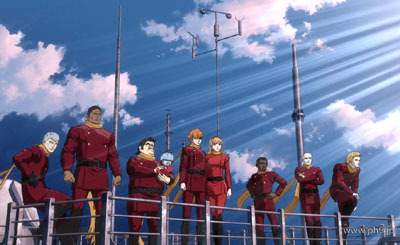 Reflecting this sensibility, as well as the current SF anime boom, the 1980 Toei film CYBORG 009 LEGEND OF SUPER GALAXY (or “Legend Of The Super Vortex” or “Meta Galaxy Saga” or “Super Galactic Legend”, take your pick) would see our nine heroes voyage into space. As a mysterious spaceship that resembles a blown-glass ornament lands on Earth, 001 and Gilmore’s pal Dr. Cosmo are kidnapped by the devil Zoa. Leader of the Dagas Corps, a heinous gang of space monsters, Zoa is out for total control of the Vortex, an amazingly powerful glowing space light that can do whatever it needs to do to advance the plot. Luckily, on board the blue spaceship is Saba, an alien boy whose own father has also been kidnapped by Zoa. Saba has come to Earth to ask the Cyborgs for help defeating this menace to intergalactic civilization. Though it’s a million light year journey that may be one-way, the Cyborgs agree and soon they’re zipping their way across the universe through the 2001-style ‘star gate’. There’s a pit stop on the ravaged planet Fantarian where 009 shares a moment with beautiful, purplish Queen Tamara, and then it’s straight into the headquarters of the Dagas Corps and into the Vortex itself for a climax that defies the laws of time and space. Those looking for brutal outer-space action may want to throttle their expectations back a notch or two for this film, which is a dreamy, almost meditative journey through elaborate galactic fantasies and cosmic landscapes that you might find airbrushed on the side of a van or on a Roger Dean album cover. Yes, it’s prog rock anime, spacey, metaphysical and a little pompous. The film resembles Toei’s 1982 space fantasy QUEEN MILLENIA, and that’s no surprise as both movies share animation director Yasuhiro Yamaguchi, who was also responsible for the rounded, smoother character redesign of our cyborg heroes. While unsparing in its display of the wonders and beauty of the universe, the film’s rather deliberate pace makes viewing more of an endurance contest than a pleasure. Released on video in North America on two separate occasions, SUPER GALAXY even made it onto UHF television in a few markets. The dub is unspectacular; 006 and 007 are rendered incomprehensible by attempts to mimic UK and Chinese accents, and the 009 cyborgs are inexplicably referred to as “The Galaxy Legion”. You might still be able to pick this one up on VHS for a dollar somewhere, it’s worth it. Beware of edited versions; one cut near the end changes the tone of the film considerably. 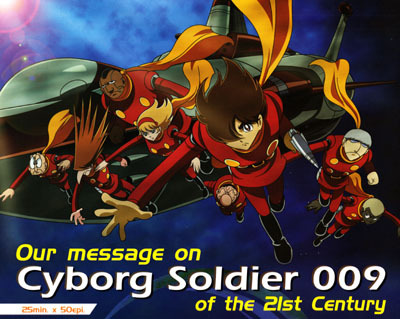 And for nearly twenty years, that would be it for CYBORG 009 animation. However, in 1998 an animated version of the Ishinomori tokusatsu classic ANDROID KIKAIDER stunned audiences with a combination of slick retro character designs and seriously great animation. Could a new Cyborg 009 series be on the way? Avex’s 2001 CYBORG 009: THE CYBORG SOLDIER series was fantastic, a colorful, well animated adventure with a sweeping storyline that embraces both world-spanning action and quiet moments of introspection. 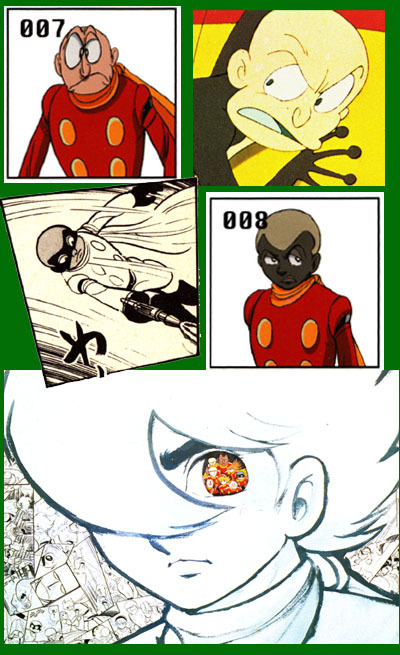 Viewers needed no previous 009 experience to enjoy the show – but it’s packed with visual references to every other animated incarnation of CYBORG 009, so fans familiar with the storyline and the characters can enjoy spotting a robot design from 1966 here, a villain from 1968 there. Jun Kawagoe’s direction is evocative, both in the action scenes and in slower moments, and the character designs by Naoyuki Konno seem to be channeled directly from the original comics. In fact the series includes two unfinished 009 chapters, and concludes with the never-before seen finale of the story, written by Ishinomori on his deathbed in 1998. THE CYBORG SOLDIER respects previous interpretations while at the same time bringing new ideas and visual concepts to the mix, and it does so beautifully. Coming as it did in the middle of North America’s anime boom, CYBORG 009 – at least some of the series - was broadcast on Cartoon Network as part of its Toonami block. 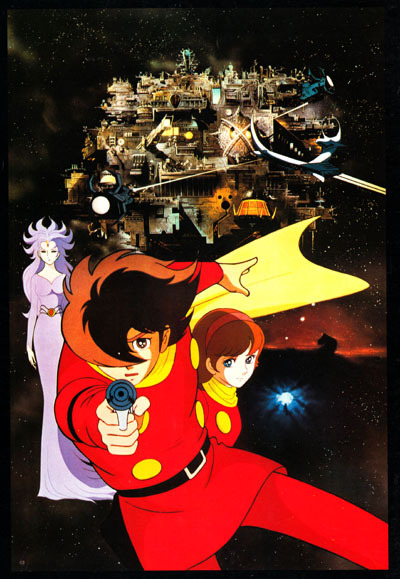 The melancholy mechanization of Ishinomori’s life work struck a chord with American anime fans, and finally CYBORG 009 began to get the kind of fan interest in the States that it had enjoyed in Japan for decades. The show got a great launch in the States, including a DVD release, and then, like so many other series in those fad-driven days, it just got walked away from. Heck, the final episode didn’t even air in Japan, instead going direct-to-video. What is this, GALVION? Or are we seeing the end of broadcast television and the start of new Japanese-cartoon delivery systems, as digital technology moves away from mass markets? I don’t know. What I do know is that the DVD is available for a ridiculously low price and you’d be foolish to not own it. When it was announced in September of 2010 that Panasonic and Production IG had produced a Mamoru Oshii-directed CG 3D CYBORG 009 short, at least American anime fans knew what the heck ANN was talking about. THE REOPENING, as this short was titled, was shown at the CEATEC Japan 2010 trade show in Chiba. 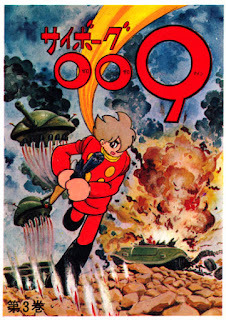 And if that hyper-realistic piece of 009 animation wasn’t enough, in 2011 we learned that Kenji “Eden Of The East” Kamiyama, who directed a 009 Pepsi NEX ad, would be directing a 3D CYBORG 009 feature from Production IG , titled 009 RE: CYBORG, for release in the fall of 2012. Teaser trailers promise a new, more realistic look for the 009 Cyborgs and hint at action sequences that put CYBORG 009 into a class with the best. RE: CYBORG caught the attention of a Japan thanks to ad campaigns centered around Panasonic 3D televisions, and the subsequent film confused audiences with a film that went nowhere fast but looked terrific getting there, giving us tremendously well-animated scenes of 005 destroying lots of things, 009 accelerating, 003 and 009's relationship becoming animation canon, all wrapped up in a story that makes less sense the more I think about it. You got Cyborg 009 in my Devilman. Well YOU got YOUR Devilman in MY Cyborg 009! The next CYBORG 009 animation project somehow tapped into the desires of every Showa-era anime nerd and, rather than a high-tech re imagining, gave us an unabashed wallow in 1970s anime nostalgia. 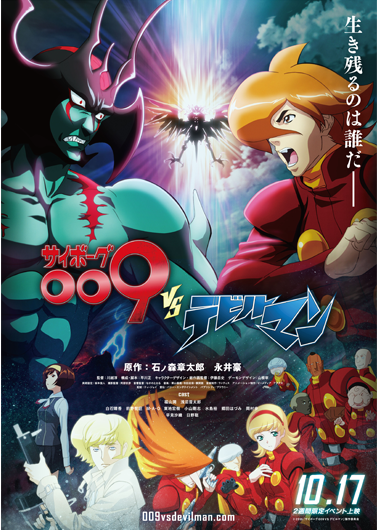 2015's CYBORG OO9 VS DEVILMAN brought Go Nagai's demon-fighting demon up against Ishinomori's cyborgs in a rollicking adventure that starts where both their 1970s adventures stop, written and drawn with their decades-old TV adventures as a template, yet building on both, in a fashion similar to the successful contemporaneous re-interpretations YAMATO 2199 and GUNDAM ORIGINS, and unlike YAMATO 2199, became available in North America simultaneously with Japanese release on the streaming service Netflix. 2017 wasn't two months old before yet another CYBORG 009 animation project appeared, the all-CG CYBORG 009 CALL OF JUSTICE. Built on the RE: CYBORG template, our heroes are re-designed once again; the subsequent computer-animated series premiered here on Netflix in March of 2017. So far, the show's callbacks to the 60s series and RE: CYBORG haven't made up for the stiff, Playstation cut-scene visuals, the wooden animation, and the plodding pace. 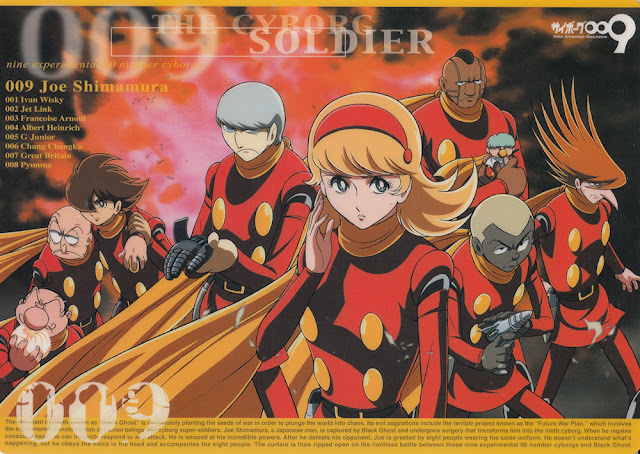 With none of the zip or the panache of darn near every other current Japanese animated production, CG or otherwise, CALL OF JUSTICE may be a slight recursive detour on the animation path of Cyborg 009. We here have faith, however, that Shotaro Ishinomori's cyborg soldiers will continue into the 21st century. editors note: portions of this article have been expanded upon and/or cybernetically enhanced to include subsequent productions.